No significant cross-reactivity or interference between Canine ADH1 and analogues was observed. MBS028369 is a ready-to-use microwell, strip plate ELISA (enzyme-linked immunosorbent assay) Kit for analyzing the presence of the Alcohol Dehydrogenase 1 (ADH1) ELISA Kit target analytes in biological samples. 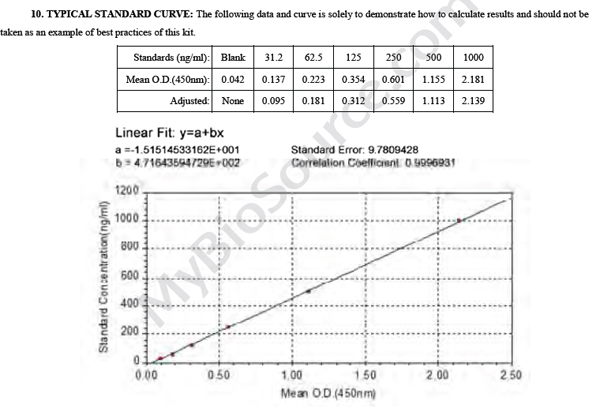 The concentration gradients of the kit standards or positive controls render a theoretical kit detection range in biological research samples containing ADH1. The ELISA analytical biochemical technique of the MBS028369 kit is based on ADH1 antibody-ADH1 antigen interactions (immunosorbency) and an HRP colorimetric detection system to detect ADH1 antigen targets in samples. The ELISA Kit is designed to detect native, not recombinant, ADH1. Appropriate sample types may include undiluted body fluids and/or tissue homogenates, secretions. Quality control assays assessing reproducibility identified the intra-assay CV (%) and inter-assay CV(%). Introduction: ELISA is a simple and highly sensitive method of analysis that allows for simultaneous and rapid quantification of a large number of samples. The assay is based on the specific recognition of the target compound (analyte/antigen) by antibodies which bind to the compound. The antigen-antibody complex is detected and measured with the aid of an enzyme-labeled antibody or antigen. Upon addition of a non-colored reagent, the enzyme produces a color reaction where the color intensity is directly or inversely proportional to the concentration of the analyte in the sample. This quantitative Sandwich ELISA kit is in tended to determinate ADH1 concentrations in Canine serum, plasma, tissue homogenates, feces, urine and body fluids, and it is only for research, not for drug, household, therapeutic or diagnostic applications!